I have no idea what I'm supposed to do. Can someone please help me? What is the difference between gene expression and protein synthesis? These products are often proteins, but in non-protein coding genes such as transfer RNA (tRNA) or small nuclear RNA (snRNA) genes, the product is a functional RNA. As shown by this picture, gene expression consist of genetic transcription, that results in a mRNA, maturation of the mRNA (splicing, incorporation of a poly(A) tail, capping, ...) and finally protein synthesis by means of translation of the mature mRNA. Protein synthesis is the process whereby biological cells generate new proteins [...]. Translation, the assembly of amino acids by ribosomes, is an essential part of the biosynthetic pathway, along with generation of messenger RNA (mRNA), aminoacylation of transfer RNA (tRNA), co-translational transport, and post-translational modification. 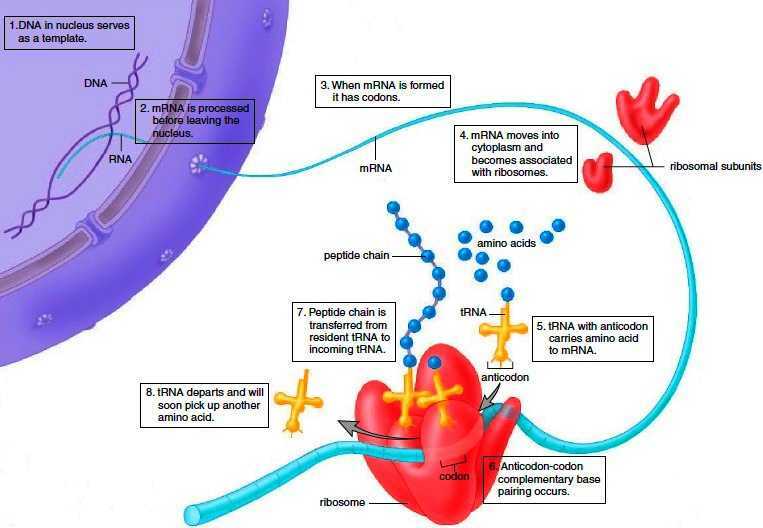 The following picture describes the process of mRNA translation by ribosomes that results in a polypeptide. Once folded in its proper 3D structure, the polypeptide becomes a functional protein. In order to work properly, some proteins need post-translational modifications, which is (citing Wikipedia again) the covalent modification of proteins following protein biosynthesis and goes beyond the scope of this answer. Not the answer you're looking for? Browse other questions tagged biochemistry proteins gene-expression biosynthesis or ask your own question. What exactly is meant by the expression “differentially expressed”? Difference between protein channels, protein carriers and protein pumps? What do the intervals between groups of arrays in microarray gene expression data images mean? What is protein secondary structure?